Over the weekend, I had an opportunity to witness my first dive meet at the Kennedy Shriver Aquatics Center (KSAC) for the USA Diving Summer Junior Region 3 Championships. Although my drive to the KSAC was short, divers from the region’s top dive clubs made journeys to North Bethesda, MD from states as far as North Carolina, Massachusetts, Florida, and Colorado. Throughout the weekend, parents, siblings and friends filled the parking lots to come out to watch and support their loved ones. With 127 divers from age group 11 & Under to age group 16 to 18 compete in diving events from 1 meter, 3 meter and platform towers. During each event, participants performed a standing dive for each round and rotated through for five rounds. Promptly after every dive, the five-person judge panel used scorecards to score the dive out of 10 points. The PA announcer would read the results into the microphone for the audience, as the diver hopped back on deck with the following diver set to perform the next dive only seconds later. While watching the events, the lower age groups were understandingly more limited to performing dynamic dives, the 16-18 age group exhibited an impressive set of dives from the 10 meter diving platform, including forward armstands, reverse somersaults, and inward somersaults. After 2266 dives later, The MDC came out on top of the competition and scored an astounding 407 points overall among the boys and girls divisions. The swimmers advance on to the Junior Zone Championships for a chance to compete in August at the USA Diving Junior National Championships in Minneapolis, Minnesota. Diving is a part of the culture in the Washington Metropolitan area, unlike other areas of the country, according to third-year MDC Program Director Doug Beavers. 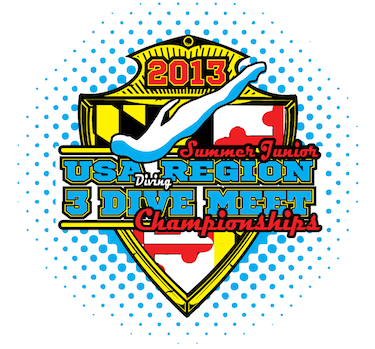 Last summer, the 2012 U.S. Olympic Dive Team selected Montgomery County Recreation to prepare for the London 2012 Summer Olympics. With its reputation of its aquatics program and optimal diving amenities available to the athletes, it was the ideal training site. Along with the KSAC, the county offers a robust selection of diving facilities for its elite diving club, including the Germantown Indoor Swim Center, Martin Luther King Jr. Swim Center, and Olney Swim Center. Recently, the MDC Dryland Training Center was established in Wall Park, adjacent to the KSAC, as part of the U.S. Olympic Dive Team’s training camp. The training center is only one of a few dozen indoor dryland facilities in the country, with amenities including two 1-meter dry diving boards with 12’ x 12’ x 32” landing pit, two 6’ x 12’ trampolines with competition beds, 25’ x 25’ spring floor for multi-purpose activities, and an overhead spotting harness over trampoline and dryboard.